Anne Pegg (Barton Seagrave) deep in conversation with Peter Buttle (Shenley). 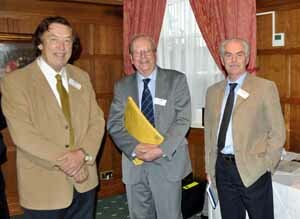 L to R: Robin Betser (Hadstock), Colin Nicholson (Colchester) and Graham Jones (our speaker). Gill Nicholson (Colchester) and Duncan Hopkin (Folkestone). In the background, Zina Pepper and Paul Kemsley (Cambridge). L to R: Patricia Croxton-Smith (Hadstock), Graham Jones and Kathleen Tyson-Quah. L to R: David Buxton, Derek Cummins, Edward and Sylivia Robertson, Janet Buxton (all from Church with Chapel Brampton) and our President, Father Timothy L'Estrange.